Our professionals successfully undertake installation of EHV Substation with Isolators of 22 KV, 33 KV, 132 KV and 220 KV. The process involves Isolators, gantries and towers if required. Moreover, the switchyards are of radial or Lilo type. We install EHV Substations of 22 KV, 33 KV, 132 KV and 220 KV. This involves CT, PT and the switchyards are of radial or Lilo type. These are being installed by using highly sophisticated machines and advanced technology. Our professionals successfully undertake installation of EHV Substations of 22 KV, 33 KV, 132 KV and 220 KV. The process involves Isolators, gantries and towers if required. Moreover, the switchyards are of radial or Lilo type. - Erection, Testing and Commissioning of power transformers up to 250 MVA including loading and unloading operations. EHV Switching Yards: Designed for 11 KV/33 KV AC 50 Hz, Detects presence of High Voltages in Overhead lines of EHV switch yards, Sub station, Indicates the presence of High Voltage by Audio & Visual Annunciation by Buzzer Beep and Flashing High Intensity Red LED’s, Telescopic Fibre Glass Rod 3 Meters or 5 Meters can be provided. We also provide customers EHV installations. Our rich experience in this field as well as availability of latest testing and other process equipment also ensure high level of accuracy is maintained while delivering the services. Widely demanded in electrical industry, this EHV Substation Allied Work Service is performed by sharp minded professionals on our team. Experts properly follow latest technology for completing this work in minimal time. 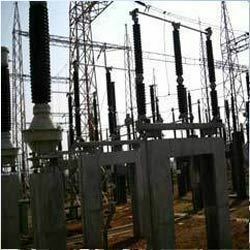 We install EHV substations of 22 KV, 33 KV, 132 KV and 220 KV. This involves CT, PT and the switchyards are of radial or Lilo type. Erection testing & commissioning of 100/22 Kv 12.5 MVA hybrid substations & 0.5 km transmission line by LILO arrangement for M/s. Reliable Fashion Pvt. Ltd., Airoli, Navi Mumbai. Supply, Erection, Testing & Commissioning of 132 Kv TR. Line 1 km & line bay for M/s. Thyssenkrupp Engine Component ( I ) Pvt. Ltd.
- HT cabling / HT Termination. We undertake installation of EHV Substations (small size) of 22 KV, 33 KV, 132 KV and 220 KV. These involve Isolators, gantries and towers if required. Our team works in close proximity with the clients to fulfill their requirements with utmost efficiency. Ehv Installations - Topworth Pipes And Tubes Pvt. Ltd.
We provide all type of maintenance services of electrical system for large scale industrial project, HV / EHV Switchyards. At present we are providing such services to Ahmedabad Municipal Corporation, ONGC & Arvind group.We take anual rate contract for maintenance & repair services. We have gained a wide market base and we are involved in installing EHV Substations of 22 KV, 33 KV, 132 KV and 220 KV. We offer industry leading prices and our overall work involves CT, PT and the switchyards are of radial or Lilo type. These are being installed with the help of highly advanced technology and we are renowned for fulfilling clients’ requirements within scheduled time limits. We provide EHV Installations. We are expert in this field as well as availability of advanced modern latest testing and other process equipment and also ensure high level of accuracy is maintained which procuring the services. Our client is one of the fastest growing business groups in Oman. It is engaged in diverse business activities which include Trading & Contracting of Electrical Products , since 2005. Our firm is engaged in offering installation services for EHV Substation of 22 KV, 33 KV, 132 KV and 220 KV. This includes CT, PT and the switch yards that are of radial or Lilo type. The professionals at our firm employ highly sophisticated machines and advanced technology to deliver these services.